Got a pic of one on my phone from a visit to the GC earlier in year. Man..., what a handsome devil ! Wow. Love the pattern of colours on the tail. Great photo! I love the way they fly up and hover in front of you - I imagine they are laughing at me. FANTASTIC. How do you know it is a male? Thanks for comments very pretty things ..aye Wagger esp if you try and photo one in flight they hover just long enough in one spot to focus and flit every time you press the shutter.. Answered on other pic Newfie . Ther thanks should go to you Bonkers. Feel lucky to see them ..but whether the little tadpoles will survive those larvae and nymphs ..? You can see where the motor bike manufacturers found their colour schemes! just gorgeous creatures! congrats on catching one obligingly still! Just very lucky Lori....he was sunning himself for about 10 minutes. Yes The norfolk...they are quite exquisite ! Great reason to leave dead stumps and bare branches sticking about for perches. 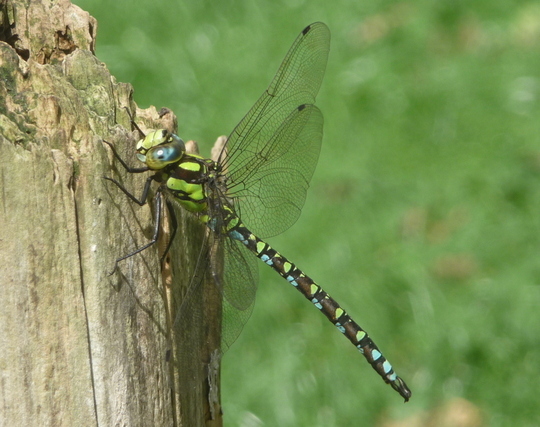 Dragonflies eat at least 100 times their weight in mosquitoes, too. Hi Orgratis...this one laid her eggs all around the pond too so will be lots of larvae as well ! Heard dragonflies have a 17 year gestation. Is that true? We'll have to keep checking your blog for years to come! Ours said to have 2 to 5 year gestation but given some of the monsters you have in US this could well be longer ! A great series of shots of the dragonfly Bonkersbon. Love dragonflys - that one is beautifully marked. Nice photo!